When I saw the opportunity to review this show for Sarah I was thrilled. As a massive Rat Pack fan and having friends that have been in top tributes I was excited to see what this show had to offer! It did not disappoint! The Show is done performed as if you were at a genuine Rat Pack show. It started both acts with a witty announcement really setting the tone for the banter to come from the main three gents. When you think of the Rat Pack you obviously think of Sinatra and Stephen Triffitt was in a word perfection! It was as if Frank Sinatra was on the stage performing. From the voice to the hand gestures Triffitt had Sinatra down to an absolute T! Having read his history in playing Sinatra he is clear a perfectionist who over the years has embodied him without flaw. Darren Charles as Sammy Davis Jr. filled the stage with his charisma and clear dance talent. His energy crackled through-out and he was hard not to watch whenever he was on the stage. Although I will say it wasn’t until he put the glasses on in the second half where he really looked like Sammy. Completing our Trio as Dean Martin was Nigel Casey. Casey had a lovely clear voice when singing and delivered his drinking and jokes with fantastic comic timing. The audience loved him and he got constant laughs right on cue. He stood out the most during his duet with Darren Charles in ‘Shall We Dance’. There was also a visit in Act Two from Nicola Emmanuel as Ella Fitzgerald. While you can’t deny Emmanuel has a beautiful voice she was a little swallowed up by the boys. She vocally was a delight to listen to and I feel should have been given more opportunity to make her personality pop. The main three men shared the stage also with three stunning ladies as the Burelli sisters. They were used to sing backing vocals, dance and dress the stage as well as having a number without the men. They were played by Amelia Adams-Pearce, Laura Darton and Joanna Walters. Amelia gave fantastic face and had a clear love for what she was doing that became infectious, making her hard not to watch. There was also a high level of dance from Joanna who had clean lines and made the choreography look effortless and sharp. The set was simple and didn’t need to be anything else. The band and MD were on stage throughout also. The band were fantastic although unfortunately slightly too loud in the first half meaning Sammy’s first number ‘ The Old Black Magic’ was completely lost, this did however even out by Act Two. The MD Matthew Freeman was also involved in the banter with the boys which was a lovely touch. He did look incredibly messing but luckily it was scripted in for a joke to be made about this early on making it slightly forgivable. The songs are ‘Subject to Change’ and a few not in the program were performed ‘Luck be a Lady’. It was a great set list however I do feel that they should have a few more of the classic songs as there were a few moments when the less known songs seemed to drag into each other. But when Triffitt performed the closing number ‘My Way’ the audience was on its feet, including me! There was clever and witty dialog throughout all exactly what you would expect from a Rat Pack show! 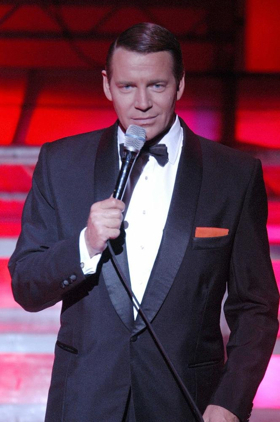 Overall whether you’re a fan of the Rat Pack or not it’s a top night at the theatre and Stephen Triffitt as Frank Sinatra is reason enough to go! He alone was worth five stars and truly stole the show with his uncanny performance of Frank Sinatra, which was a pleasure to watch. To find out more about the Rat Pack and what else is on at The Orchard Theatre check out the Orchard Theatre’s website. If you like this review you might also like my review for Thriller, New Jersey Nights and Bat Out of Hell.